If you couldn't figure it out from the picture... It's exercising! Many of our TIMC employees don't have the time to excercise in the morning (some of us have kids, and after all, we're not superhuman!) it was something we all really wanted to incorporate together into our daily routine at the office. When Jeanne asked us all what kind of team activities we wanted to do in the summer, outdoor excercise and working out together was out top suggestion. 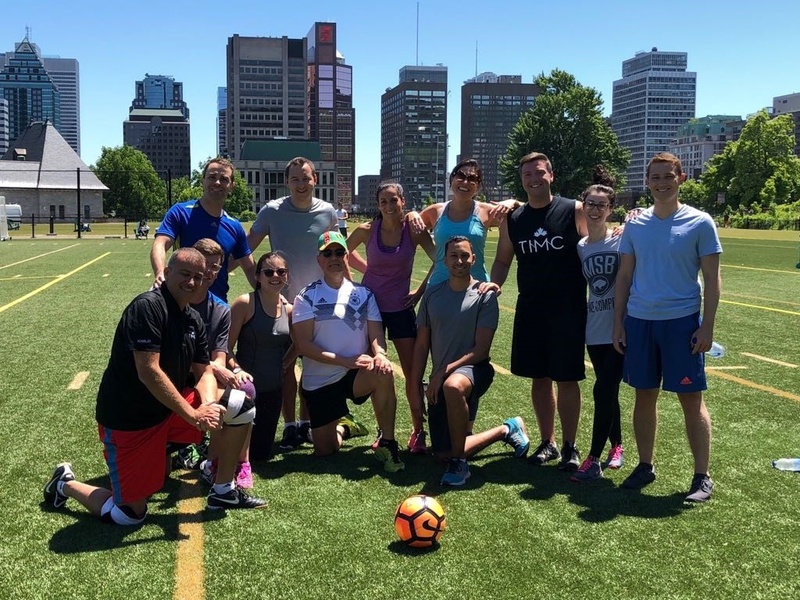 Luckily for us, YUL Fitness has a gym right below us in the basement of our building, so Jeanne organized for us to partake in an outdoor bootcamp class with one of their trainers at lunch - and man has it been whipping us into shape! Not only have we all been more energized in the afternoons, feeling better, getting some vitamin D at lunch, but this has also been an awesome team bonding experience. We are a very competitive group - and this gives those of us with more athletic ability than others a chance to really compete (apart from when the sales team plays squash, which they do regularly). Not only are we incredibly lucky to have management that listens to us - we said we wanted to be outside, and we said we wanted to excercise, and they listened - but we are also lucky to have such amazing opportunities for us to excercise in the gym downstairs or outside.